"Let's do Nohorn Creek." Pete said. It was Friday night, and we were mulling over our options. It had been raining hard all week and everything was booming. All the boaters I knew were thrilled and amazed to have so much water, and we suddenly had so many options we couldn't decide what to do first. It had been way too long since that had been the case! "Nohorn?" I asked. "Where the heck is that?!?" "It's a trib of the Hot Springs Fork of the Collowash." Pete replied. "and the way the weather's going, it'll be snowed in pretty soon if it isn't already. We'll have to do it this weekend or probably not til' next year. Looks like about 2.5 miles, 150 fpm. I've seen a pretty cool ledge looking upstream from the take out bridge. We can continue down the Hot Springs Fork and run Pegleg after, or hike up and do the Upper Hot Springs run.."
I called John Whaley and left a message. "John, this is Jason. Meet us at Bobs hole at 8 tomorrow morning. We're gonna run Nohorn Creek.."
I hung up the phone, confident that John would be there, even though I knew he had never heard of Nohorn and had no idea what it was like. He called later and we agreed to ride up together. The next morning we met Pete and Michael Young at Bobs and we headed upstream. We saw the first patches of snow when we crossed the Oak Grove Fork and started climbing uphill. "Ohhhh Boy, this is not good.." Pete said as we wound up into the mountains the snow started to thicken alongside the road. Soon the rain turned to snow as we took a right and started climbing up towards the Hot Springs Fork. "I hope my truck can make it up there." Pete said. "No worries." I said cheerfully. 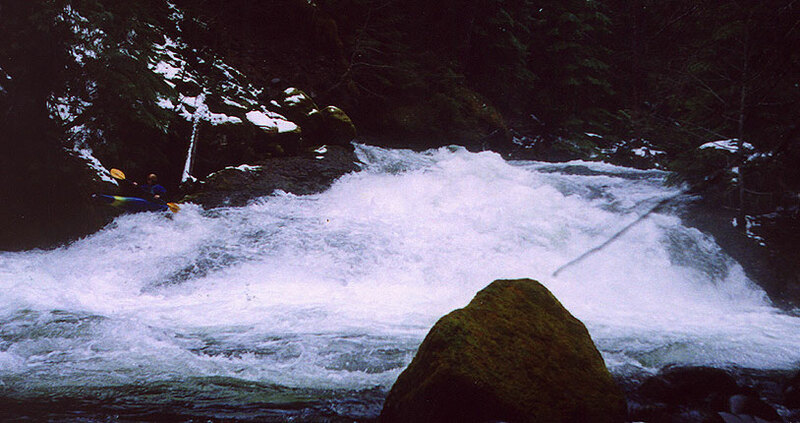 "We can hike up to the put-in if it gets too deep; the snow just makes dragging your boat easier..."
We left Pete's truck at the turnoff overlooking Pegleg Falls on the Hot Springs Fork and headed upstream in Mike's burly Suburban. The snow got gradually deeper as we wound our way up the road, but Mike plowed on ahead without batting an eye. "You need to get a snowplow attachment for this thing." Pete said. "There's no way my truck is going to make it up here after we are done..."
Soon enough we arrived at the upper bridge over Nohorn, which looked really good. Below us the creek swirled along in a narrow channel with deep green water and a tiny hint of bedrock. Just downstream the creek turned abruptly and dropped over a horizon line, so John hiked down through the snow to check it out as we got ready under the bridge. "No problem." he said when he came back. "Run it anywhere you want." I peeled out and dropped around the corner through a nice little warm-up drop. Downstream the creek twisted around another blind corner, so I caught an eddy and got out to shoot some photos. Michael Young cruises down over the fun little drop just below the put-in bridge. Just downstream from the first drop we rounded a corner and saw Pete ahead of us in a tiny eddy on the right. One by one we dropped down into the eddy above what ended up being a river-wide log jammed across the top of a small ledge. Everyone portaged this one except Pete, who cruised downstream and hopped easily over the log while we stood by in case of a mishap. Downstream the creek gradually broadened as it began to drop away through continuous, splashy class II and III drops. 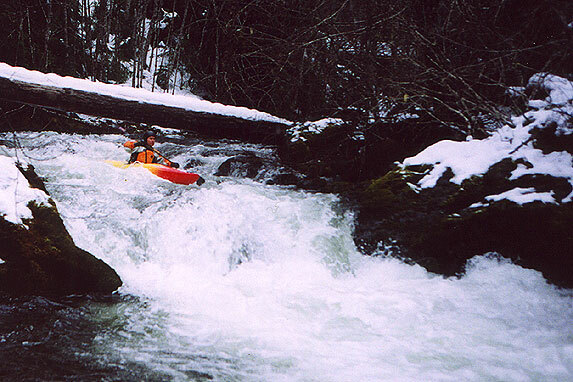 The trees towered overhead, flocked with snow and ice, and suddenly we found that we were having a very good time on this obscure little creek..
John rides the curlers on a fun drop about halfway down Nohorn. Soon the creek took a very sharp turn to the right into what looked like a logjam on the left side of the creek. The water was moving very fast and there were few eddies to be seen, so I eased down around the outside left corner for a peek. As I got closer I saw that the creek was all clear downstream, but there was a considerable horizon line down there.. suddenly I heard a deep roar and I quickly scrambled over to the right side into a small eddy between two large boulders. 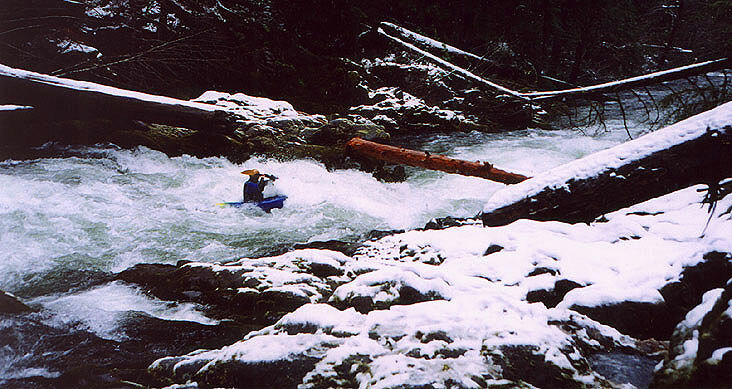 I got out to scout as everyone else waited upstream, and when I topped out on the boulders I stopped cold. "Wow..." I muttered. Below me the creek was positively screaming over a large slide that dropped fifteen feet over a dome-shaped ledge. Most of the water was sliding over to the left into a hideous hydraulic that resembled a low-head dam. I looked at the steam shooting out of the hole and quickly scrambled upstream to give an emphatic: "Don't miss this eddy." signal. Soon I was joined by the others and we contemplated how to run the drop. "Looks like we got ourselves a little class five action here." I commented. John took one look at the hole and shouldered his boat, while Pete and I climbed down to creek level to study it. The key was to stay right, but there was a large, jagged roostertail rock on that side that the water was piling into with terrific force. If it weren't for that, I am quite sure we would have all run this drop. As it was, we looked at steam boiling out of the hole on the far side of the creek, weighed the likelihood of swimming out of it (pretty good) and opted to portage the top part of the drop on the river-right side. We put in about two-thirds of the way down by climbing down the steep slope, and slid down the bottom of the ledge into the pool below. 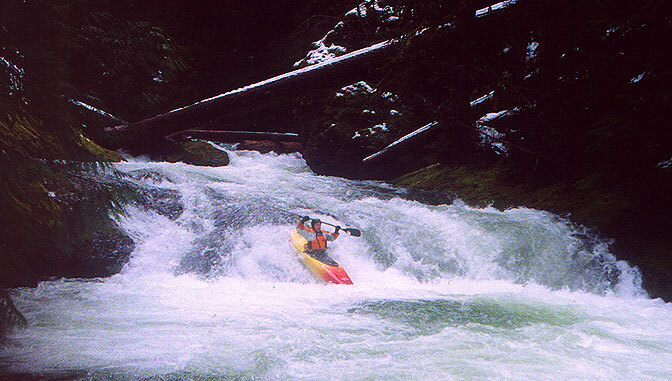 Later we dubbed this rapid: 'Cookie Monster" because of the huge, munchy hole that dominated the far side of this drop, at least at this flow. John boofs the bottom of the Cookie Monster. Getting to where he is would be impossible without a partial portage because of the roostertail rock about halfway down on this side. Most of the water goes river-left, into the meat of the hole, which recirculates against the wall. Below the Cookie Monster were a couple of fun, splashy drops and then the walls started to creep out of the water again. "You know.." I joked to Mike at one point.. "If I were doing an exploratory run and started seeing geology like this, I would be thinking 'waterfalls'.." I paused. "Oh, wait, we are doing an exploratory run..."
Soon enough the walls steepened and the creek was blocked by a river-wide log. 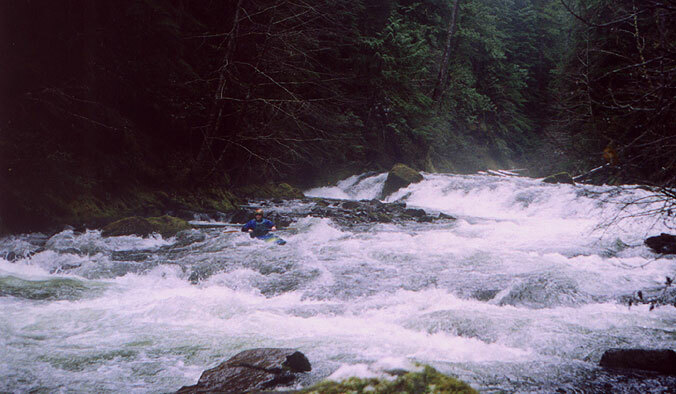 We got out on the left hand side, but we couldn't see downstream as our view was blocked by an enormous boulder. We were able to climb up between the boulder and the wall, and then we eased downstream on the wall to see what looked like a very nice six foot ledge. Mike and I got down to creek level and peered over the edge, and it looked clean. "Left side looks good." I thought, looking at where most of the water was going. "The hole is angled slightly left, so if you hit it on that side it should kick you downstream.." The hole was slightly horseshoe shaped, but I could see that the left side was kicking juuuust enough.. I peeled out and charged down the left side straight down into the gut of the hole, where John later said I totally disappeared from sight. I was underwater long enough to wonder which way was up, but after a couple of seconds I surfaced upside down. I could hear the roar of the hole and I knew it was close, but I wasn't quite sure how close. As I set up to roll my paddle hit something (the wall on river-left) and I pushed off of it hard as I rolled up. Sure enough, it had kicked me left..
Pete came down next and cleaned it, carving down along the far left wall without getting his head wet. John and Mike had both seen me go into the hole, so they made a more well-informed decision and decided to boof the middle. Mike boofs over the middle of the ledge. Below here were some more fun rapids and then the creek split around a small island in the middle of the creek before dropping over another large horizon line. We could see the bridge downstream, so we knew we were at the final ledge. We all ran this one right down the middle, because the narrow right side pours onto a large boulder and the left grinds against the wall on that side. John below the last ledge visible from the road bridge. Downstream from here the creek joined the Hot Springs Fork of the Collowash and we took out above Pegleg Falls. Pete ran Pegleg and had a really interesting line. He charged down the left side, (which is how we have run this drop in the past) but he wasn't in his creekboat this time... He disappeared into the foam for a second, and then shot straight back up into the falls and immediately flipped, and rolled back up. We all got a pretty good laugh out of it, and it was interesting to see how such a long boat behaved on a drop like this. 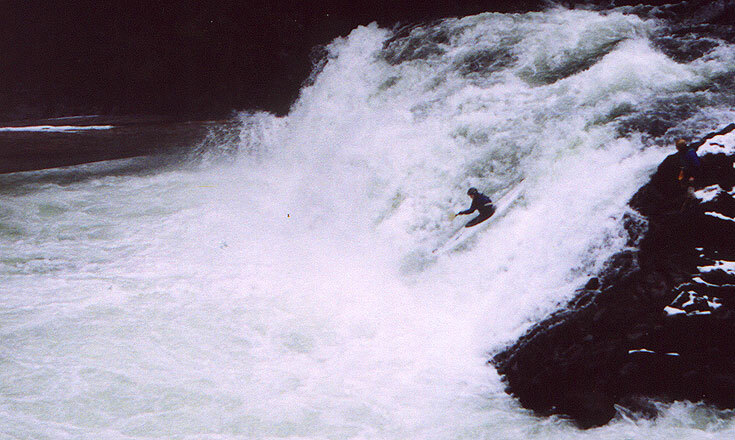 John joked later that it looked like 'launch day at Cape Canaveral' when that big ol' white boat came shooting up out of the foam and back into the falls. I wish we had gotten video footage! FLOWS AND NOTES: I must say that Nohorn Creek kind of caught me by surprise. This is the cleanest and most entertaining exploratory run that I have done in the Clackamas watershed, and I had never heard of it until the night before I did it. The road that accesses Nohorn gets snowed in pretty early. Pete returned a week later with a different group and there was two feet of snow on the road, so he ended up hiking several miles to reach the put-in. On the day of this trip report the Clackamas at Three Lynx was at 4000, rising to 5000 by the end of the day due to rain. Pete ran it later at about the same flow on the gauge, but the freezing level had dropped and all of the water was locked up as snow so the creek had noticably less water in it. That said, the best time to do this run is early in the season (before snow blocks the road) during or just after a big rainstorm. The Clackamas at 5000 seems to be a pretty good indicator of a suitable flow assuming that the freezing level stays high enough.